Sold from Polmadie depot during the late Summer of 1972, D8568 went to Hemelite of Harpenden, a cement company on the former branch line between Harpenden and Hemel Hempstead. It was purchased because the company's own shunting locomotives had limited haulage capacity. A visit to Polmadie secured the locomotive along with a small fitted van loaded with spare brake equipment, electrical equipment and a 450hp Paxman power unit. Arrangements were made to work D8568 South, arriving under its own power on the 11th September 1972 and in doing so became the first 'privately owned' ex-main line diesel loco to break the 'no private diesels BR ban'. 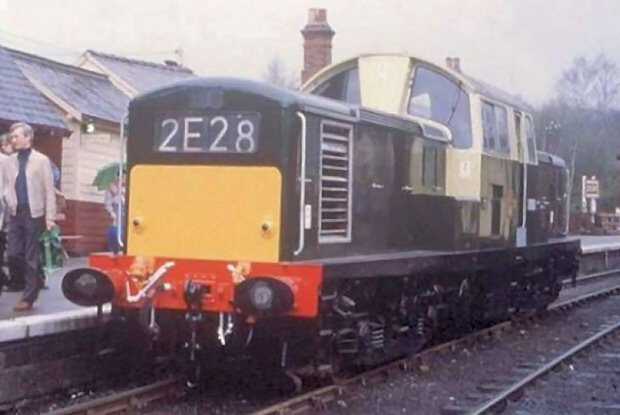 This claim to fame is often quoted as going to Warship D821 Greyhound, although the difference between the two was D8568 was going for industrial use where as D821 was going for preservation. On the 12th of September D8568 was trialled using six mineral wagons as a train and worked up and down the branch to the Hemel Hempstead factory. The loco was affectionately known as 'Gavin' after the owners son, and the locomotive enabled more wagons to be carried, resulting in less rail journeys and more savings for the company. D8568 remained in use at Hemel Hempstead until the higher costs of using rail traction forced the company to turn to the roads. So D8568 and two smaller shunters were put up for sale with the North Yorkshire Moors Railway taking the two shunters. Ironically D8568 would end up here in preservation later too! The Clayton was sold to Ribble Cement (now Castle Cement) and proved ideal for shunting its heavy trains at Clitheroe. On 16th June 1977 D8568 left Harpenden for Cricklewood where minor attention was given to enable it to make the long journey North by rail. On the 20th of June it departed Cricklewood making its way Northwards in various freights until reaching Clitheroe on the 24th of June. Here D8568 was repainted into the new owning company colours of light grey upper body with the running plate, bogies and underframe in dark green. The company logo of a castle was applied to the cab sides and nose ends and small lights displaying red and white were fixed along the frame sides to warn staff of its presence. Another decline in traffic again, this time for Ribble Cement, saw the loco put up for sale once more. The unique Clayton D8568 is seen here standing adjacent to Grosmont shed on the NYMR. 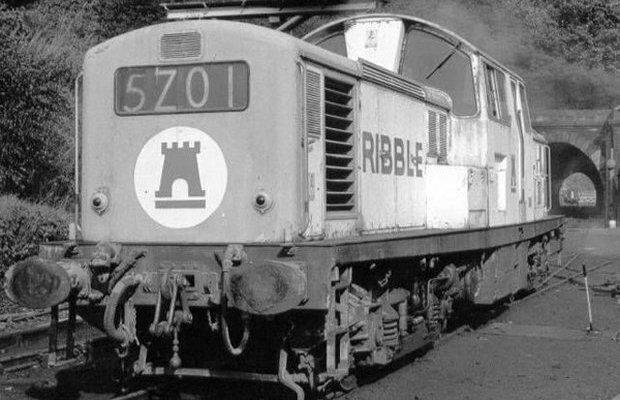 The livery is that of the previous owner Ribble Cement (later Castle Cement) - concrete grey body with olive green underframe and bogies. The DTG made an offer of £1000 and it was accepted, provided we took all of the spares away as well. D8568 left Clitheroe on the 9th of February 1983 going by road to Pickering and a new life on the North Yorkshire Moors Railway. Its first run in preservation was on the 1st of April 1983 to Goathland and back followed by its first passenger run on the 16th of April hauling the 11:55 Goathland to Pickering. The Ribble warning lights, made from what seemed like old car indicators, were removed and one of the most tedious jobs was the removal of years of hard concrete dust. It was everywhere! On the 26th of June 1985, D8568 was taken out of traffic for a long overdue overhaul. Engine work was started and we found one engine to be low on compression and it was discovered that two sets of gaskets had at some time been fitted under the cylinder heads by mistake. One set was removed and the engine compression was returned to normal. We also fitted two new stronger fuel pumps, salvaged from Hymeks as spares for D7029, to alleviate the age old Clayton problem of fuel starvation. In order to prove that fuel starvation was caused by inadequate original pumps we fitted one end of the loco with a temporary fuel tank from a 45 gallon drum mounted on the locos long bonnet! Work on painting the loco in green livery began in December 1988 and was completed by April 1989 and return to traffic again on the 22nd of that month. D8568's last day in traffic on the NYMR was on the 27th of April 1991, having accumulated 657 miles. An offer was received to have the loco based in the South, closer to its owners which saw D8568 depart from Grosmont in the company of D821 on the 2nd of August 1991, hauled by 47401 to Gloucester and the Horton Road depot open day. From here it went to Old Oak Common via Westbury and was an exhibit at the Old Oak Common Open Day on the 17th and 18th of August. D8568 had to travel to London in vacuum braked trains from Gloucester and she was tripped in engineers trains which travelled around the Country. A break at Old Oak Common enabled us to catch up on outstanding work and a trip over to Willesden for tyre turning was undertaken before finally, on the 25th April 1992, D8568 was hauled to its present home on the Chinnor and Princes Risborough Railway. 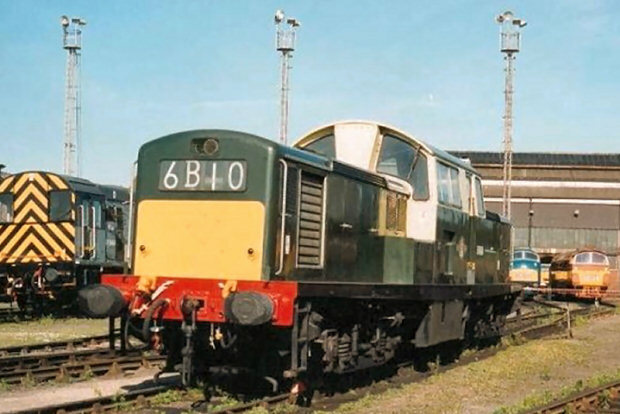 'Gavin' in 1991, D8568 poses at the Old Oak Common open day on the 17th and 18th of August, fellow DTG locomotives Warship D821 'Greyhound' and D1015 'Western Champion' can be seen in the distance. At Chinnor the locomotive has undergone mechanical repairs to the No1 engine with reconditioned liners fitted. The originals had suffered from erosion caused by the water as it circulates around the engine, its force on the outside of the liner literally bombards it and eventually wears the liner away. The No2 engine and main generator have been removed to allow repair work to the generator to take place. Preventative maintenance has ensured constant reliability from the loco, a policy which, had BR adopted it, would have seen the class far less troublesome. A brief visit to the Severn Valley Railway for a diesel gala event in October 1998 is the only time D8568 has left Chinnor. Repairs to the No2 engine and generator have meant the loco has run on one power unit for much of the time although the operational 450hp rating is more than enough to haul the railway's passenger and engineers trains.